[PDF] The Promise of American Life (The James Madison Library in American Politics) | Free eBooks Download - EBOOKEE! Description: The Promise of American Life is part of the bedrock of American liberalism, a classic that had a spectacular impact on national politics when it was first published in 1909 and that has been recognized ever since as a defining text of liberal reform. 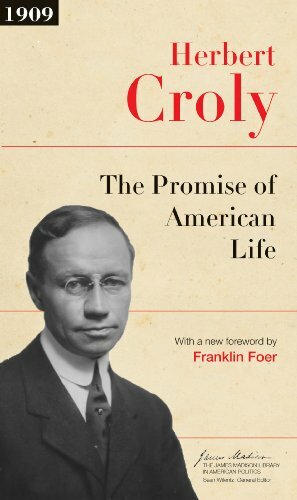 The book helped inspire Theodore Roosevelt's New Nationalism and Franklin D. Roosevelt's New Deal, put Herbert Croly on a path to become the founding editor of the New Republic, and prompted Walter Lippmann to call him twentieth-century America's "first important political philosopher." The book is at once a history of America and its political ideals and an analysis of contemporary ills, from rampant economic inequality to unchecked corporate power. In response, Croly advocated combining the Hamiltonian and Jeffersonian traditions and creating a strong federal government to ensure that all Americans had a fair shot at individual success. The formula still defines American liberalism, and The Promise of American Life continues to resonate today, offering a vital source of renewal for liberals and progressives. For this new edition, Franklin Foer has written a substantial foreword that puts the book in historical context and explains its continuing importance. No comments for "[PDF] The Promise of American Life (The James Madison Library in American Politics)".